As usual we’ll be holding a Charity Raffle at our Open Day this coming sunday, with ALL proceeds going to our designated charity, which this year will be Marie Curie Cancer Care. Tickets cost just £1 per strip, and could win you one of these 10 fantastic prizes! Other Open Day News: New RSGB Area Manager, Mark Sanderson, MøIEO will be attending the Open Day on Sunday. Congratulations to Steve Richards, G4HPE, who purchased the 500th Kenwood TH-F7E that we have sold, and courtesy of our friends at Kenwood there is goodie bag winging it’s way to him as we speak. Steve said that the TH-F7E is “a fantastic radio & working great” which is good to hear. Steve is a BBC engineer and will soon be departing to work on the BBC’s coverage of the World Cup in South Africa! He has promised to send us a picture of himself using the TH-F7E at one of the stadiums, where he’ll be using the ZS10 callsign for the duration of his stay. Good to talk to you and I returned home to find the goodie bag! Thank you very much for this, a complete surprise and plenty to adorn the shack here. I head off to Johannesburg on 30th May and will be there until 14th July, so plenty of time to get the manual out for the TH-F7E and learn some of its advanced features. Being until now the owner of the ‘classic’ but rather outdated FT290, I am amazed at the advances in the design of handies and on a recent Raynet event I was particularly impressed by the battery life. Through my involvement with the IRESC organisation, I have several good ham friends in South Africa who I hope to keep in touch with via their repeater networks, so I should give ZS10/G4HPE a good airing in my few hours of downtime a day. I will try to get a decent photo of a bit of operating with a World Cup back-drop although it may not be straight away as I am spending a lot of my time in the International Broadcast Centre which is a very dull technical bunker. I can’t promise to put it into Beckham’s hand, either! Thanks again for the bag of goodies and for the first rate service all round. The Waters & Stanton Open Day article on page 11 of the June 2010 issue of PW magazine, gives the incorrect date!!! The open day is NOT being held on Sunday 24th May (the 24th is actually a Monday!). The correct date does appear on our advert in the inside front cover. 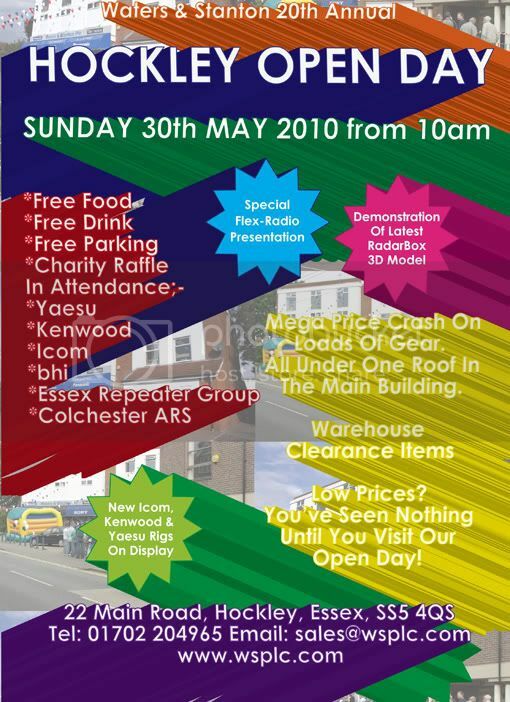 The W&S Open Day takes place on Sunday 30th May, the bank holiday weekend as per usual. We hope to see you all there, please make sure your friends are all aware of this mistake. Many thanks for your understanding. Due to the excellent performance of the W&S team in finishing second in the recent GoKarting Charity event, we have just received a cheque from the organisers to go to the charity of our choice. You are currently browsing the Waters & Stanton Blog blog archives for May, 2010.